Eurotunnel Le Shuttle is the car and train service linking Folkestone, England, with Calais, France, via the channel tunnel. The fastest method of travelling between the UK and France with your car, the Euro tunnel crossing time is just 35 minutes, with up to four departures an hour at peak times. Not only is it the quickest option, it is also the most hassle-free way to travel, with no fuel supplements or luggage restrictions and offering flexible timetables. Moreover, you have the ability to make Eurotunnel bookings up to 11 months in advance, allowing plenty of time for any last-minute changes to your trip. It is worth noting Eurotunnel check-in times are usually at least 45 minutes before your departure. This gives you time for security checks and to use the terminal facilities which include restaurants, cash machines, a bureau de change, toilets and a 24-hour information desk, while your pets can be exercised in the designated area. The UK Eurotunnel terminal is based near Folkestone, Kent, with a dedicated motorway exit at Junction 11A of the M20, so it’s very easy to reach from almost anywhere in England. The French terminal is located just outside Calais, off Junction 42 of the A16 motorway; the Euro tunnel journey from London to Paris usually takes around six hours by car. The idea for a tunnel connecting the two nations has been around since 1802, followed by a series of unsuccessful proposals until the 1980s when private companies were invited to put forward their plans; one of the rejected proposals included a 4.5 kilometre suspension bridge. 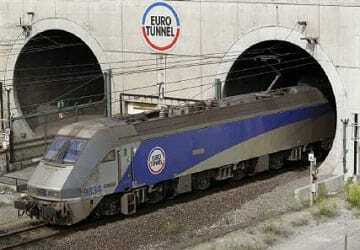 The company Eurotunnel Le Shuttle was then formed in 1986, beginning construction in 1988. How did they build the Eurotunnel? 11 tunnel boring machines digging 250 feet a day were used, each weighing an enormous 1,100 tonnes. In fact, the total amount of spoil from the tunnel increased the size of the UK by 90 acres and could fill Wembley Stadium 13 times. The system consists of shuttle trains conveying cars and coaches, with each shuttle measuring 775 metres long. The Channel Tunnel is one of the largest feats of UK engineering ever completed, spanning 31.4 miles (50.5 kilometres), with an average depth of 50 metres, and taking over 13,000 workers from both France and England five years to complete the project at a cost of roughly £9.5 billion. The tunnel was eventually completed in 1994 and opened by Queen Elizabeth II and President Francois Mitterrand on May 6th. "Swift, efficient and professional service - highly recommend"
Visited Belgium for the weekend. And could not have been easier. 30 minutes after driving in to the shuttle carriage we arrived in France! And a few minutes later we were driving north to our destination for brunch in Brugge. "trip to the cotwolds. Fantastic!" We took the eurotunnel.Never been so quick in traveling to Gr.Britain! Everything was flooding in eachother just like a piece of cake. No problems with tickets. Even when we came back,taking our tickets in Folkstone was really smooth! Corse it is still lot of money.But if time is money...... Thank you Direct Ferries, we will come back. We've used direct ferries before as they are reasonably priced and haven't had any problems also trains are on time and we get through with the dog without any problems would recommend to others. for me my experience is about speed rather than comfort. Fast and efficient service is what I am looking for and this service provides it. no complaints and I will use it again in the future.